Some examples of polygonal churches have been encountered earlier in this book, like the Temple of Minerva Medica in Rome (fig. 95) in Rome and its derivatives by Michelozzo (S. Annunziata, Florence) and Brunelleschi (S. Maria degli Angeli, Florence). The centrally planned church had been a distinctive Renaissance ideal, guided by geometry and a quest to reach the ‘perfect shape’ (fig. 263). Fig. 263 – The Gertraudenkapelle at Wolgast (Pommern) is an example of a polygonal chapel. Duke Bogislaw X initiated its building after he returned from his pilgrim’s tour to the Holy Land in 1498. However, the application of this scheme was inconvenient in the day-to-day practice of the Church service. The position of the altar in relation to the congregation and the route for ceremonial processions posed serious practical problems. Another conclusion could be that the Church – in the approach to the Pivotal Point of the European history (1500) – was not ready to challenge the humanistic tendencies in its services. Another curious and less-known example of an earlier stage in the cultural presence of Europe is the Santa Sofia church in Beneveto (Italy) (fig. 264). The church was built around 760 AD, which is identified – in a quadralectic interpretation – as the beginning of the (visible) visibility of Europe-as-a-cultural-entity (fig. 267). Therefore, the building of the church of Beneveto coincides with the birth of a culture. Fig. 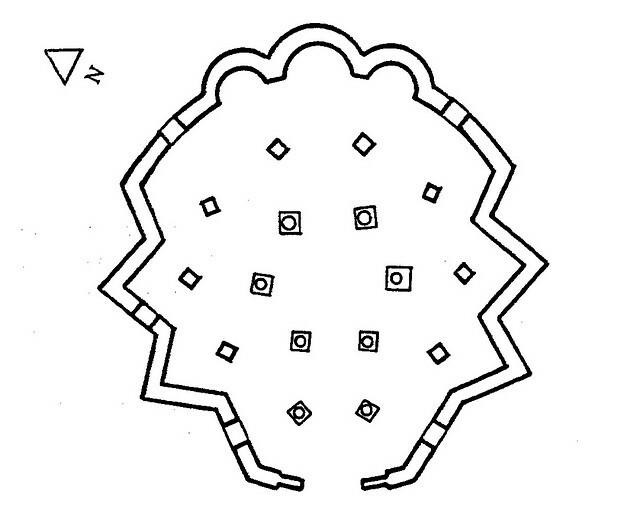 264 – The ground plan of the Santa Sofia in Benevento (Campania, Italy) has a curious irregular polygonal outlay. The church was built around 760 AD, which is at the very beginning of the visible visibility of the European cultural presence. Beneveto is situated some eighty kilometers north east of Naples, in the Campania region. The city was in the heydays of the Roman Empire a communication center along the Via Appia (Rome – Beneveto) and the Via Traiana (Beneveto – Brindisi). The Arco di Traiano (114 AD) is a remainder of that important period of the visible visibility of the Roman cultural period (now identified as the end of the Third Quadrant, see fig. 88). The early medieval church of Santa Sofia – named after the Hagia Sofia in Constantinople – was studied by Rocco Leonardis (LEONARDIS, 2002), who tried to find the key of its geometrical pattern. There seem to be no fixed division plan and in particular the absence of an axial bilateral symmetry is striking. There is no sign of a rectangle, an octagon, a circle or a square – which were the most common features in church building. The church is truly ‘eccentric’, but Leonardis proved convincingly that the characterization of ‘naivety’ or ‘provincialism’ is not justifiable. Two theories were proposed by Leonardis to explain the scheme of design based on symbolic geometry. The simpler solution takes a geometric form (like the rotated square, fig. 265) and studied its alterations. This approach gives a reasonable explanation of the overall circular unity and the zigzag lines in the ground plan, but it does not account for the position of the interior columns and piers and the three apses. The more complex approach deals with four geometric symbols superimposed on top of one another and then selectively applied. Fig. 265 – The rotated square as a design diagram for the S. Sofia church in Benevento (Campania, Italy), build around 760 AD. 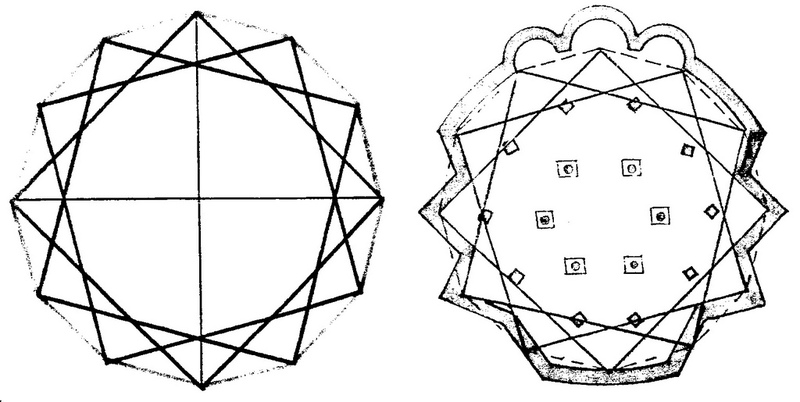 This geometric symbol offers, according to Rocco Leonardos, the simplest solution to the explanation of the eccentric ground plan of the church. The more satisfying solution consists of four geometric symbols superimposed, one over the next, and then a deliberate selection of fragments of each of the four diagrams. Leonardis favored the latter, multiple solution: ‘The plan of S. Sofia contains a layering of familiar symbols connoting divine and cosmic protection, from which a single form has been extracted.’ (p. 118). He distinguished the initial use of four symbols, i.e. a square, a circle, a rotated square and a six-pointed star or Shield of David. The outcome of the final design was then reached by leaving out certain elements. The procedure gives – as many such efforts of measurements on ancient buildings – always a somewhat artificial and elaborated impression. The lack of direct ‘proof’ does not enhance the matter either. Despite these traditional objections, such a procedure is – as seen from a quadralectic point of view – worthwhile in its own right. The assumption of a multiplicity (in the use of various geometric symbols) leads to a formal expression of a unity and opens windows to a progressive architectural reality. Quadralectic architecture is embedded in this procedure. The architect takes on the unity of possibilities (1), makes a subjective selection to create a symbolic entity (2), resulting in a recreated form with an identity of its own (3), which takes in place in a multitude of interpretations (4). This game of manipulating a fixed number of components was already noted by Boethius (480 – 524) in his book ‘De Institutione Musica’ (Fundamentals of Music) and later repeated by Thomas Aquinas (1225 – 1274). ‘In fact, the Thomist ideal of beauty depends in great part on this ability to divide and re-arrange: “dividing things results in a variety of elements and rearranging them restores them to unity in accordance with the rule of proportion” (WU, 2002; ECO, 1988). This process might well have taken place in the design of the S. Sofia in Benevento. The architectural achievements in Europe closely mirrored the political developments and are a reflection of the social powers, which acted within the new (historical) visibility. The Ottonian Revival of the tenth century followed after the fragmentation of the Carolingian Empire in the ninth century. The Saxon dynasty of Otto the Great and his successors (Otto II and III) ruled much of Europe from 936 to 1002. The Church also recovered from the attacks of the Vikings, Saracens and Magyars, which destroyed much of the earlier Western monasticism. The Benedictine abbey of Cluny was founded in 910 and proved a stimulant for the formation of similar monasteries. The spirit of revival, in a political and theological sense, resulted directly in the building of churches all over Europe. Nigel HISCOCK (2000) studied the ‘Platonic’ geometry (fig. 266) of medieval abbeys and cathedrals in an effort to find a relation between the architectonic features and measurements of these buildings and a possible design theory at the time of their conception. His field of research was focused on the period around the ninth- and tenth century. Fig. 266 – The ‘Platonic’ solids or regular polyhedra are polygons whose vertices and faces are of the same types. 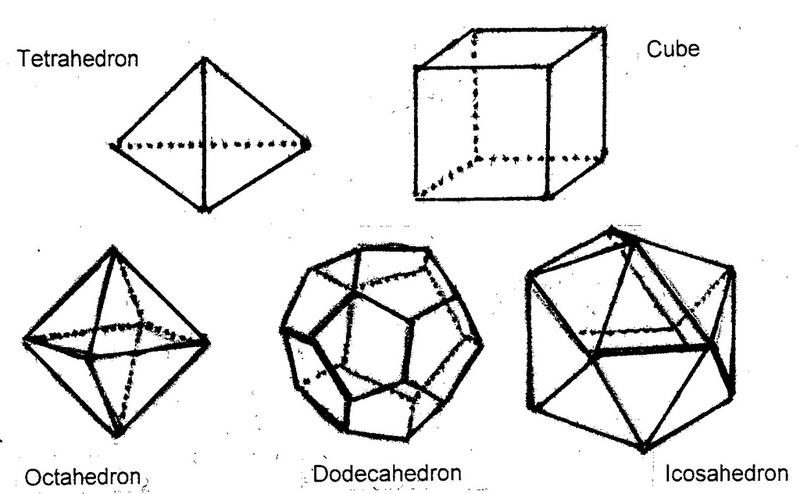 In three dimensions, there are only five regular polyhedra: the tetrahedron (number of faces 4), the cube (6), the octahedron (8), the dodecahedron (12) and the icosahedron (20). Plato associated (in the Timaeus) the tetrahedron with fire, the cube with the four-squareness of the earth, the octahedron with air and the icosahedron with water. The dodecahedron (12) was, according to Plato, for ‘embroidering the constellations’, pointing to the zodiac and the cosmos. The Cologne cathedral (constructed between 800 – 870), the early history of St. Michael in Hildesheim (consecrated in 872; KOZOK (2004), p. 30), St. Peter and Paul in Montier-en-Der (rebuild under Adso in 983) and the St. Bénigne in Dijon (consecrated in 1018) are examples of that period of expansion. Hiscock studied the early Norman abbeys at Bernay (Nor-mandy), Jumièges, Mont St Michel and the St Stephen in Caen, together with some examples of a younger age. He noted (p. 25) that ‘despite the amount of attention that has centered on the twelfth century, a more fruitful period to examine could well be the tenth’. The relative simplicity of the Romanesque period provides a better view on the matter of geometry than the rather exuberant developments in the Gothic period, which followed’. This observation can be adhered to in a quadralectic historical framework. 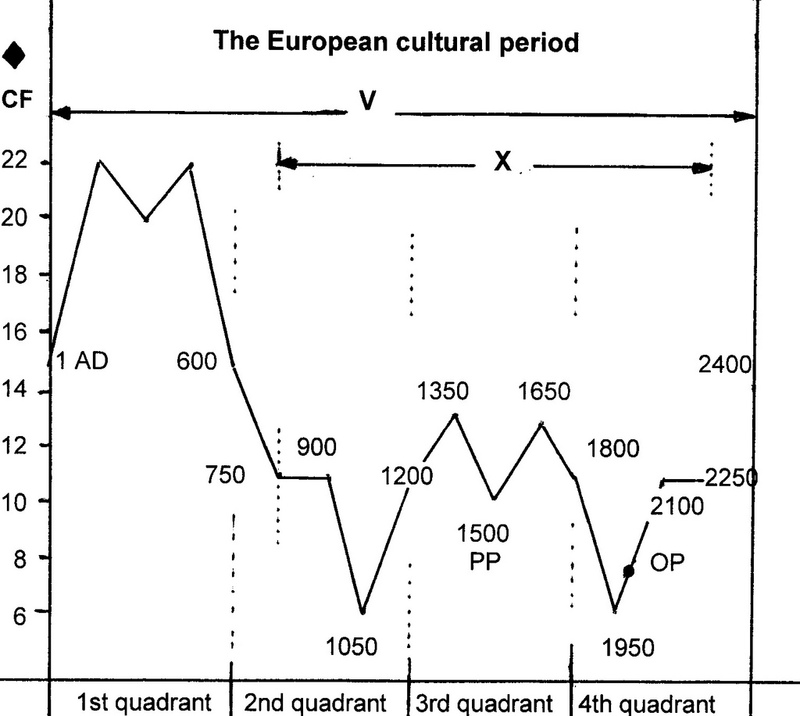 An interpretation of the visibility period (V) of the European culture (fig. 267) indicates an approach to profundity (CF = 6 in the year 1050 AD), partly in a state of undefined awareness, reflecting the invisible visibility of the Second Quadrant). Fig. 267 – The communication (CF) graph of the European cultural history as defined by an observer at the beginning of the twenty-first century (Observational Present, OP). The communication cycle (V) starts at the beginning of the Christian calendar (1 AD). The beginning of the visibility period X is positioned in the year 750 AD, when the reign of Charlemagne marked an effort to create a united Europe. V = one complete communication cycle (veleen). X = (visble) visiblity area. The Platonic geometry has, according to Hiscock, three basic ingredients: the square, the regular triangle, and the regular pentagon. Other investigators added the hexagon and the octagonal as possible design references and even the decagon was noticed in medieval chapter houses and choir chevets. The geometric figures point, in an arithmetic sense, to a three-, four-, five-, six-, eighth- (or double four) and ten- (or double-five) division. 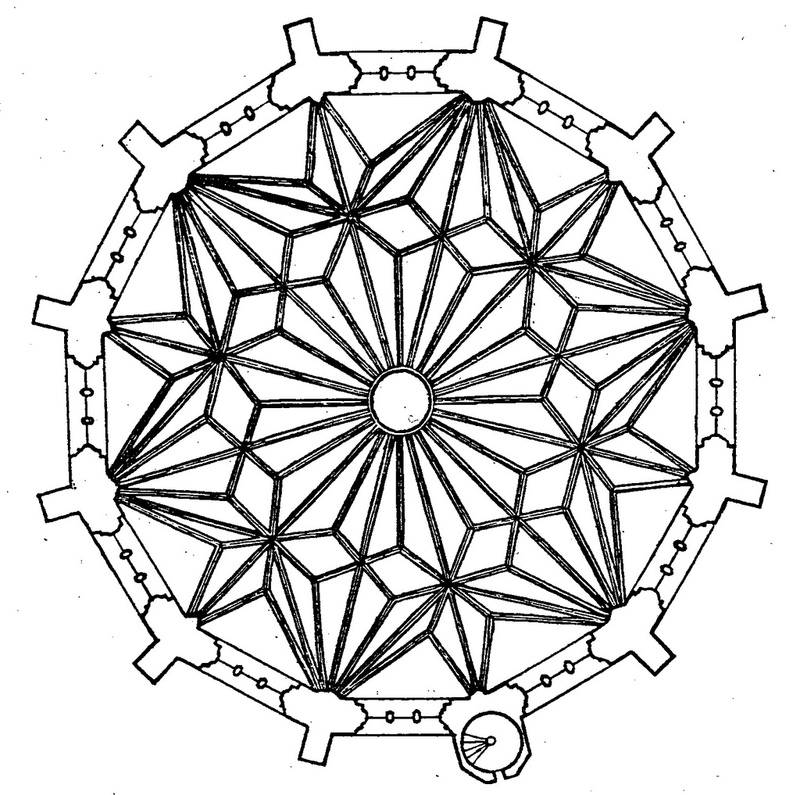 The architectural achievements (in the Middle Ages) were guided by division thinking in general and not by the application of certain preconceived (Platonic) ideas about geometrical values. The building plans of the medieval abbeys and cathedrals had no master plan or ‘key’. They were a product of the state of mind of the designer/ architect/stonemason. That person’s capacity to understand the width of division thinking in the context of a cultural development was all that matters. This complex of relations is subsequently viewed from a Western European point of view at the turn of the twenty-first century. The question can be posed ‘How wise were the Master Builders?’ – in reference to the title of Hiscock’s book – and the answer is: we don’t know. During the tenth century, there was a decline in the size and complexity of the west work, at least in the Roman church architecture of the Maas- and Rhein areas. The full Carolingian west work of the Reims Cathedral, for instance, was torn down and replaced by a more modest structure in 946 AD. (SANDERSON, 1988). It seemed that a kind of balance was aimed at after the initial Carolingian period of relative exuberance and expansion. The experimental urge was momentarily lost and the European architecture prepared itself for an encounter with its essential being. This rather negative evaluation of a (Platonic) scheme does not mean that the builders of churches in the tenth and eleventh century were completely unaware of numerical ratios and quadrature. On the contrary, their designs rooted in a deep, but partly unconscious, presence of such mental entities. They were not yet concerned with the historical achievement of the Greeks and Romans, mainly because of a lack of knowledge and familiarity of that past. The ‘classical’ guidelines, like Vitruvius’ (ten) books on architecture, were no real inspiration for Christian church building in the tenth and eleventh century, although manuscripts of the book did survive in multiple copies throughout the Middle Ages. However, the different versions did not have illustrations and were written in a rather difficult kind of Latin. Alberti commented, in relation to Vitruvius, that ‘the Greeks thought he was writing in Latin and the Latins in Greek.’ It was only in the Renaissance, at the end of the fourteenth century, that the Roman architects became instrumental in a reinterpretation of their heroic past. In particular the illustrated edition of ‘De Architectura’ by Cesare Cesariano (Como, 1521) contributed to be of a lasting influence of classical forms in architecture. This chapter on the polygonal ground plan of churches will be ended here. More examples can be given, but there is no intention to be exhaustive. Most importance, from a quadralectic point of view, is their evolutionary position within the history of division thinking. The striving for Unity, which might be an aim for many builders, can be found in the circular. The multitude of the polygonal is just a legitimate way to reach that goal.